Come Find Your Nest. Start Your Free Rental Search! Your Best Choice For Finding a Rental? Start your rental search with us. We have a comprehensive list of apartments and condos for rent in Jacksonville, FL as well as the popular surrounding areas such as Intracoastal, Ponte Vedra, Mandarin, St. Augustine, Downtown, Jacksonville Beach and more. Our friendly, knowledgeable experts know the rental market inside and out. We are locals and will help you find the perfect apartment, condo, or home rental based on your needs, wants, and criteria. Our relationships with a large amount of apartment management companies gives us the inside scoop on the latest apartment and condo availabilities. Our inventory is continuously changing so make sure to check back with us to get the most comprehensive list of available rentals on the market. We know searching for a rental can be stressful, and rental inventory availability changes constantly. We’ll save you countless hours of wasted time searching for the perfect place to live. Online rental ads, pricing, and information change daily. Our local rental experts do all the legwork for you based on your price range, and personal search criteria. Whether you are looking for a 2 bedroom by the beach or a 3 bedroom apartment that’s pet friendly complete the free apartment search form and access a list of hundreds of available apartments based on your individual needs. Nest Finders Property Management has been in the Real Estate & property management business for a long time. Because of our roots in our community, we work with a wide array of local area property owners and investors, as well Jacksonville apartment communities in all price ranges, and many Jacksonville condo rental communities through private owners. We also have a huge inventory of Jacksonville rentals that we professionally manage. Apartments, Condos or Homes for rent, we’ve got you covered! Yes, for Jacksonville renters our service is 100% FREE. No charge, no fees, just free. Landlords and Apartment Communities throughout the Jacksonville area are looking for great renters like you. We can help you find a great apartment rental, condo rental or the perfect home for rent. We help the owners find great tenants like you. It’s a match made in rental heaven. Nest Finders Property Management is also a Property Management company and we are confident we can save you money. We know Jacksonville rental market pricing, apartment rental specials, up to the minute availability, preferred employer discounts, and student discounts. Many local property owners, apartments, and condo communities update unadvertised specials with us daily. Nest Finders Property Management understands personal needs are unique, so why should your rental search be any different? You deserve a personalized service and a search based on your living requirements and needs by a professional Jacksonville Rental Company. We offer a totally customized and unique search process based on the personal criteria that matters to our tenants. We offer rental searches that factor YOU and your needs into the equation. Incredible service, Crystal found me the perfect place. She was able to get me a reduced deposit and two weeks free rent. This made my move incredibly easy compared to my previous move. Thank you! Our experience with Nest Finders Property Management was truly first class. We worked with Stephanie and could not have asked for anyone better! She went above and beyond for us. If you are looking for a rental, I would recommend them 100%! We are Jacksonville’s premier FREE local rental finding service. Our service is free to you, the renter. We want to help you find the perfect place to call home. So whether you are looking for a Jacksonville apartment, townhouse, home, or condo, we can help you get it done. We have nearly a decade of experience helping Jacksonville renters, and we will help connect you with the rental home of your dreams. Our friendly staff knows the ins & outs of the local area, apartment, condo, home rental availability, move-in specials and discounts. We will work hard to get you into the right location for the right price. 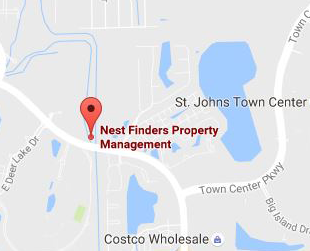 Test us out and see what makes Nest Finders Property Management the rental service of choice for renters throughout Duval County and St Augustine.